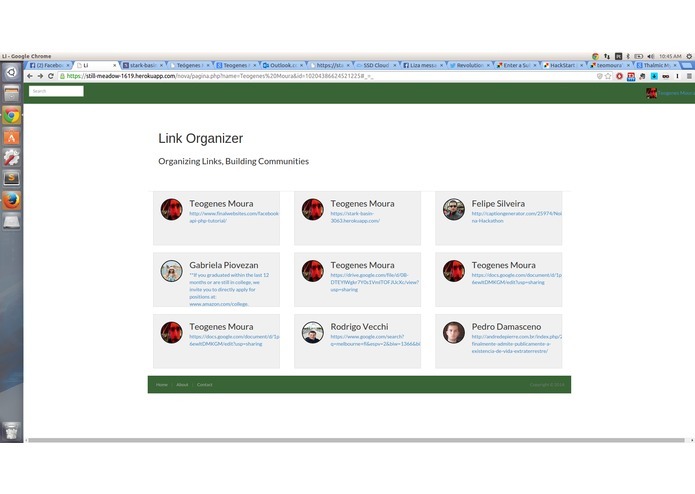 Organizing the tons of links we receive everyday while building a community! One of us has a girlfriend who is really a fan of sending links through facebook messages, and sometimes he even get into trouble because he doesn't open all the links she sends. When he said that, we quickly realized that all of us have the same sort of problem: not opening the links as soon as receiving them and then forgetting at all about it or being too lazy to scroll the whole conversation up. So, we've built a solution that scans your conversation on facebook and extracts only the links, organizing them by person who sent so that you're able to catch up with all of your friends without ever getting asked "Why haven't you looked at that link I sent you?"